The International Association of Golf Tour Operators, the global organisation for the golf tourism industry, has granted this award to the Costa del Sol at the International Golf Travel Market. 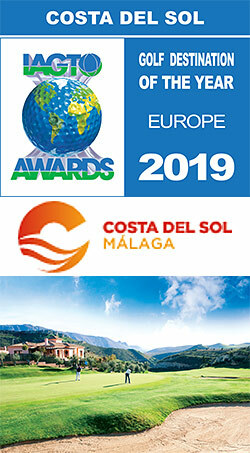 18 October 2018 - The Costa del Sol has received the award for European golf destination of the year from the International Association of Golf Tour Operators (IAGTO), an association of 2,716 golf tour operators which control more than 87% of golf holiday packages sold around the world and whose sales of over 2.1 billion euros a year impact golf resorts, hotels, golf courses, inbound operators, airlines, tourist offices and business partners in a total of 105 countries. The president of Costa del Sol Tourist Board, Elias Bendodo, has expressed his gratitude for the award, granted by the most important companies in the international tourist industry, declaring it "an honour for us to receive an award of such magnitude from the International Association of Golf Tour Operators”. The recognition of the Costa del Sol as the best European golf destination of the year "reaffirms our leadership, both nationally and internationally, endorsed by a range of more than 70 courses, almost 70% of those that exist in Andalusia", said Bendodo. “As a segment which has a direct and indirect economic impact of 1.400 million euros, Costa del Sol Tourist Board has considered golf a priority for several years, given our strategic approach to the management of seasonality. And now, thanks to this award, both the organisation, and the destination, have received a huge incentive to continue along these lines. At Costa del Sol Tourist Board we will continue to work, alongside our valued partners and industry members, to maximise the golfers’ experience, thanks to the quality and quantity of our golf courses and resorts, together with excellent air connectivity, transport and hotel infrastructure and, of course, the multitude of leisure and entertainment services offered by the destination”, added the president of the Tourist Board. The award carries significant weight in the tourism sector since those responsible for granting it are the tour operators themselves, experts in their field, with in-depth knowledge of not only the Costa del Sol - Costa del Golf, but also of the other destinations which compete for business in the global golf tourism market. The award was announced during the awards ceremony organised by IAGTO at the gala dinner attended by more than 600 delegates attending International Golf Travel Market (IGTM), a fair founded by the association, which this year was held from 15 to 18 October in Slovenia and in which the Costa del Sol was an exhibitor, together with many golf-related companies from Málaga and the rest of Andalusia. Every year, at this event, the association rewards the outstanding achievements of many emerging and consolidated golf destinations as well as individual golf resorts, thereby promoting its primary objective: to raise industry-wide standards of the segment and help destinations position themselves not just to attract more business, but to provide the best possible experience for the visiting golf traveller. IAGTO ultimately works to "provide information and create opportunities to help its members to develop their business faster, with less effort and lower cost", as explained by the founder and chief executive of the association, Peter Walton. With this accolade the Costa del Sol puts the finishing touch to its participation in IGTM, one of the most internationally recognised events of the golf industry, which brings together a total of 1,300 golf tourism professionals from more than 65 countries, including around 500 tourism service providers in the sector, more than 400 golf tourism operators that collectively control 80% of the global market for this segment, and about 100 international journalists. During the fair, Costa del Sol Tourism Board promoted the destination in the international market through various activities and networking days, including face-to-face meetings with the most important international tour operators who attended the fair. The organization also organised a "Night with Friends from Costa del Sol-Costa del Golf" on 14 October, bringing together for a networking dinner the representatives of Costa del Sol’s golf tourism industry and the international operators and media at the Hotel Intercontinental in Ljubljana, offering a drinks reception, presentations by the participating companies, and a finale of flamenco music and dance, providing the perfect setting for informal business talks. The Costa del Sol also highlighted its presence at the fair thanks to different branding campaigns and via IAGTO’s own media channels.